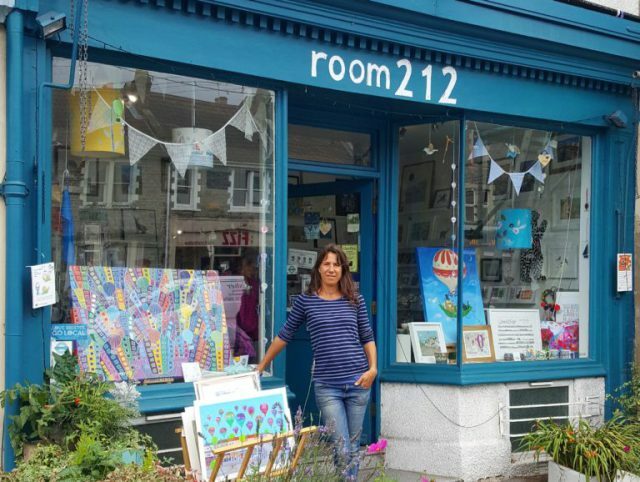 Sarah Thorp is the owner of Room 212, an arts and crafts gallery on Bristol’s Gloucester Road. She has helped put on events such as Mayfest, the North Bristol Art Trail and Gloucester Road Christmas Street Party for the BCR Neighbourhood Partnerships – and is a Champion for the Avon Wildlife My Wild City Project. In the run up to our second ever Winter Fayre, we asked Sarah what she loves about the local area, why she started her business and what we can expect from her Winter Fayre stall- plus much more! What made you settle on the name ‘Room 212’? Room 212 was the name of the pop up shop which was here when I bought the gallery. The shop is number 212 Gloucester Road! What sort of things can people expect to find at the Room 212 stall? An eclectic mix of work by local artists including handmade Christmas cards, prints, jewellery & books. I make my own upcycled vases and jewellery so I’ll bring some of them. We have our own Room 212 calendar with a different artwork on each month for just £10. In your opinion, what is the best thing about Bristol? The wonderful creative, independent spirit of the city. Do you have a favourite piece of art you have made? I’m really pleased with the Room 212 calendar as it represents all the fantastic artists we represent. What inspired you to start Room 212? There are so many artists in Bristol and I wanted to bring them all under one roof, and have a place to sell my own artwork as well. Have you been to Bookbarn before, and what did you think of it? No. I’m looking forward to visiting! Do you enjoy winter – and if so, why? I love creating colourful, welcoming window displays to brighten up the Gloucester Road on a winter’s day, especially for Christmas, Window Wanderland and Valentine’s Day. How can people keep in touch with Room 212? We have a website www.room212.co.uk with all our contact details – plus Facebook, Twitter and Instagram. The Bookbarn Winter Fayre takes place this year on Thursday 30th November from 4pm.